North and South Korea exchanged artillery fire along the countries' western border, Seoul officials said, in the latest flareup of cross-border violence. The South's defense ministry said the incident began Thursday when North Korea fired shells at South Korean military positions. The South responded by launching dozens of 155 millimeter artillery rounds at the North, the ministry said. A South Korean news agency reported that the North's projectiles appeared to have landed in a mountainous area near a South Korean military base in the town of Yeoncheon, 60 kilometers north of Seoul. No casualties have so far been reported. South Korea's finance ministry said top economic and financial policymakers would meet early Friday to discuss the impact on the economy and markets from the exchange of fire with North Korea. A ministry official said deputy chiefs from the finance ministry, central bank and two financial markets watchdog agencies are due to attend the meeting, scheduled to start at 7:30 a.m. (2230 GMT Thursday). 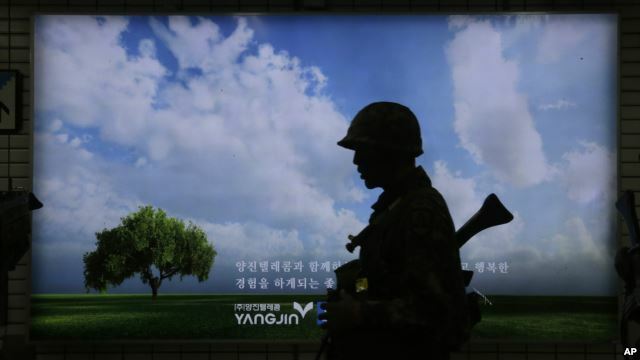 North-South relations have been particularly strained after Seoul accused Pyongyang of planting landmines that exploded this month, wounding two South Korean soldiers. South Korean authorities initially ordered a civilian evacuation in Yeoncheon. The Paju region, where the landmine incident occurred, was added to the evacuation list, as was the western island of Kanghwa. After the landmine incident, South Korea restarted cross-border propaganda broadcasts via loudspeakers that had sat dormant for over a decade. North Korea responded with its own propaganda broadcasts. North Korea denied any involvement in the landmine attack, and last week threatened "all-out military action of justice to blow up all means for anti-North Korean psychological warfare" if South Korea did not immediately stop the broadcasts. 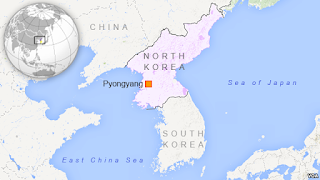 Several reports have suggested that the North Korean artillery fire was directed at or near the propaganda speakers. South Korea has raised its military readiness alert to its highest level, Jindogae 1, indicating immediate danger, imminent attack or invasion. South Korea’s National Security Council met with President Park Geun-hye about North Korea artillery shelling in border area. The exchange of fire was the first between the two Koreas since last October, when North Korean soldiers approached the military border and did not retreat after the South fired warning shots, the South Korean Defense Ministry said at the time. The North's soldiers fired back in an exchange of gunfire that lasted about 10 minutes, with no casualties.